I promised in the last blog that I would do blog posts for our two big trips last year. I’ll start with our trip to Paris. We took an evening flight out of Boston and landed in Paris around noon. Unfortunately, we both have difficulty sleeping on planes. We arrived exhausted but avoided the temptation to nap. We headed straight to the Centre Pompidou, which is the modern and contemporary art museum. They had an exhibit that featured Marc Chagall. This made me very happy. And I saw a lot of my other faves in their collection. One of the things that made this trip a little difficult was that there was a strike going on. The trains were only running a few days a week, and when they were running there were cancellations and delays. For our second day, we had planned on taking a train to both Giverny and Rouen, but due to the delays we were only able to go to Giverny. We will have to visit Rouen next time! Before this trip I had read Ross King’s book, Mad Enchantment: Claude Monet and the Painting of the Water Lilies. 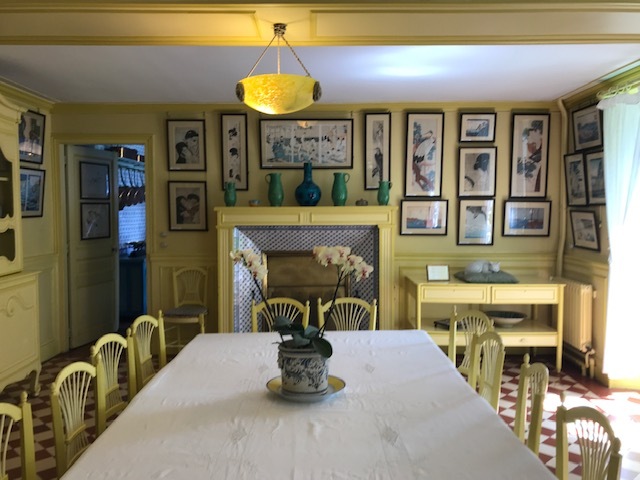 I learned that you can actually visit Monet’s home and gardens in Giverny. I also learned that Monet actually created the garden that was the subject of so many of his paintings. 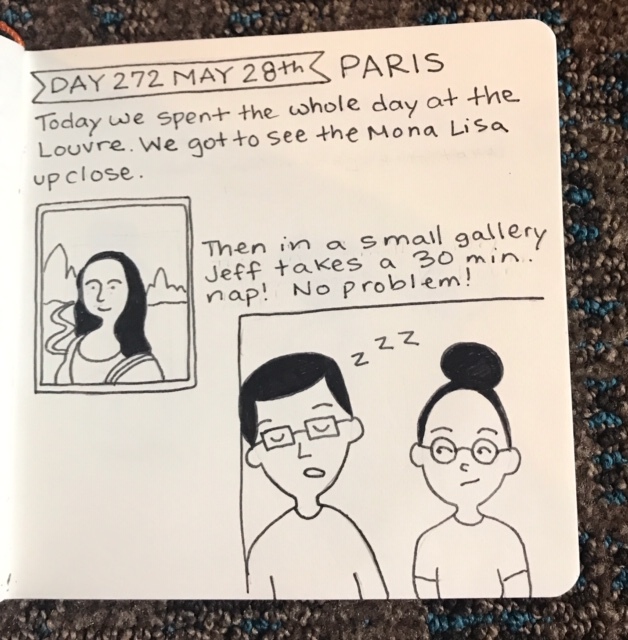 The next day we went to the Louvre. The Louvre is amazing but overwhelming. There were so many paintings we would have loved to see but couldn't fit everything in. We tried to see as many of the highlights as we could. Jeff was actually able to take a nap in one of the quieter galleries. Jealous! How does he do that? The next day, Jeff was hotel bound with traveler’s diarrhea. After a trip to the pharmacy, I went for a walk. I decided to visit the Luxembourg gardens. When I was doing research for the trip, I had heard about this carousel that I thought might be nice to check out. The gardens are actually quite big and it took some time before I found it. Along the way, I took the happiest wrong turn and saw this!!! What?! Why hadn’t I heard about this? It’s amazing! It’s the Medici Fountain, and it depicts a story from Greek Mythology of Acis and Galatea being discovered by the jealous cyclops Polyphemus. I could go on about the story and this fountain, but maybe I’ll save that for a later post? I did find the carousel. I am glad I looked for it because I found the Medici fountain, but the carousel did not meet the hype. Later in the trip, I went back to the gardens with Jeff so he could see the fountain, too. 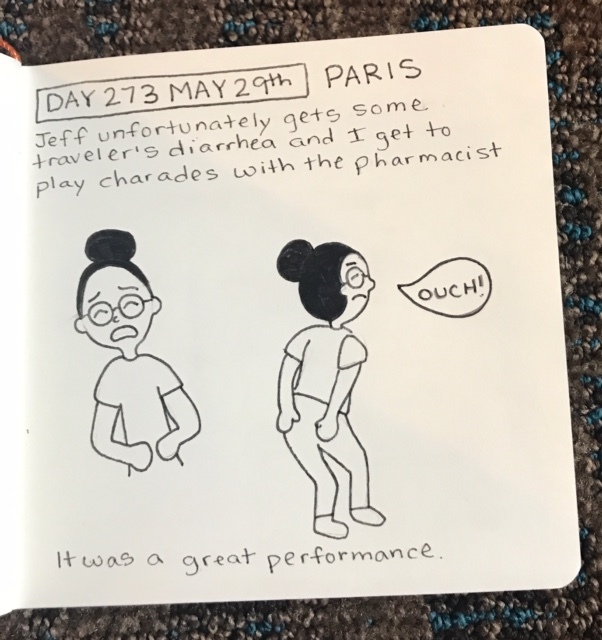 The next day, Jeff was feeling better and we headed to Versailles. 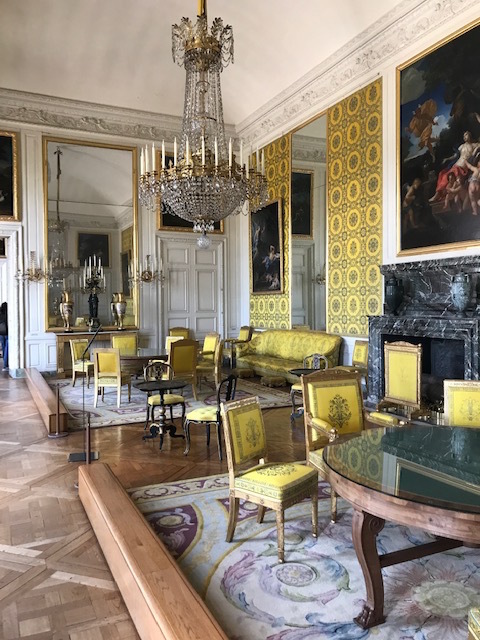 Versailles was big and beautiful, just as I had expected. The day after, we started our day with a tour of Notre Dame. I fell in love with the gargoyles and all their personalities. 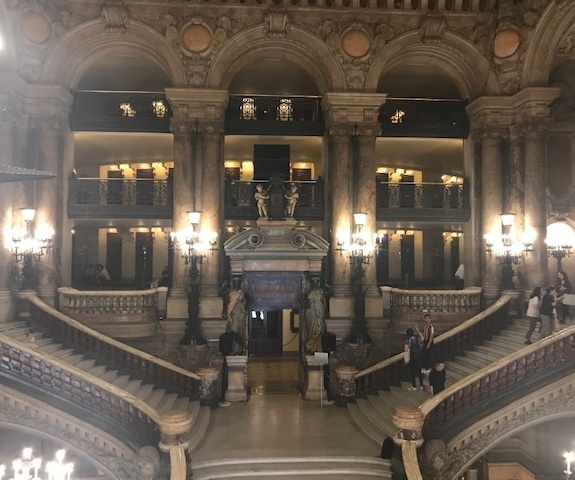 Then to top it all off, we visited the Musée D’Orsay. I actually like this museum more than the Louvre. It was a doable size. It wasn’t nearly as crowded. It had beautiful paintings, and I wanted to photograph everything I saw. I won’t overwhelm you with all of them, but trust that there are a lot more! The following day was a lot quieter. We took a day trip to Chartres. We went there to see the famous Chartres Cathedral. We heard about it in an art history class we took through the company The Great Courses. We just so happened to go on a Friday when they remove chairs from the nave so that you can walk around the labyrinth. Many pilgrims still come to this church to do just that. It is seen as a way to get lost, tune out your surroundings, and achieve enlightenment. For the last day of our trip, we got our selfies at the Eiffel Tower and the Arc de Triomphe. We visited the Basilica du Sacre Coeur. Lastly, we went to La Fée Verte and tried some absinthe!